This period the Royal Air Force 11 Squadron, based at Leeming, flying the Tornado F.3, exchanged with the Italian Air Force 9 Gruppo based at Grosseto, flying the F-104S/ASA. It was a 2 way exchange. Starfighters seen in the UK included TF-104G MM54251/4-34 and F-104S/ASA aircraft MM6802/4-1, MM6880/4-12 and last but not least F-104G MM6529/4-52. All aircraft flew via Bitburg. 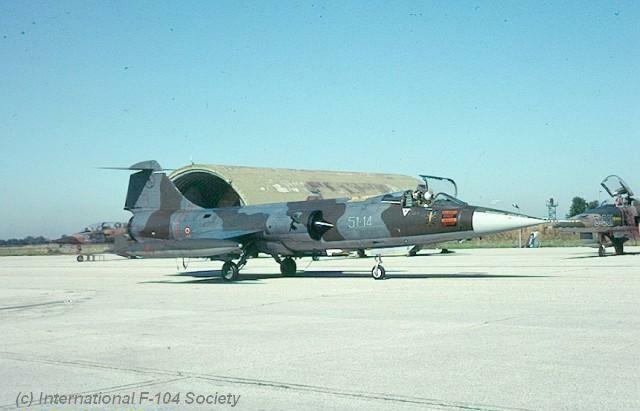 This month the Turkish Air Force 152 Filo, based at Merzifon AB and flying the F-5A, exchanged with the Italian Air Force 22 Gruppo based at Istrana AB, flying the F-104S/ASA. It was a 2 way exchange, Italian Starfighters seen in Turkey were MM6719/51-06, MM6843/51-03 and MM6870/51-04. 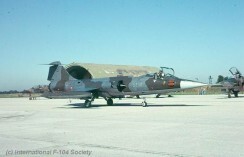 The photo shows F-104S MM6934 code 51-14 taxying at homebase Istrana while in the background the Turkish F-5s can be seen, participating in the squadron exchange. This month the Turkish Air Force 161 Filo, flying the F-16C and based at Bandirma AB, exchanged with the Italian Air Force 10 Gruppo based at Grazzanise, flying the F-104S/ASA. It was a one way exchange, only the Italians flew to Turkey. This month one of the Danish Air Force squadrons at Aalborg AB, flying the F-16A, exchanged with the Italian Air Force 12 Gruppo based at Gioia del Colle, flying the F-104S/ASA. It was a two-way exchange where four camouflaged Starfighters were seen at Aalborg.